Active strategies, combined with more traditional passive strategies, can offer the potential for lower drawdowns and volatility, multiple layers of diversification and risk management, and enhanced returns. Active investment management was originally the product of investment professionals thinking they could beat the market by picking superior companies and investing in their stock. For many years this held true. Top-tier fundamental stock selectors were able to routinely “beat the market,” and, as a result, money flowed into mutual funds managed by active teams with a mandate to pick stocks. As financial and investment information became more abundant and accessible, paying a fee to a professional was less of an advantage. Managers began to find it more difficult to convert value into outperformance, or alpha, compared to major benchmarks. As a result, stock-picking managers would buy top conviction names and give them a little more weight. To minimize the risk of trailing their benchmark, they would then add in many smaller positions that would all too often erode the value added by the high-conviction names. The result was that investors paid more for an investment experience that closely aligned to that of an index. Passive management firms—and then investors—started to catch on to this and took action. Investment dollars began flowing from the powerhouses of active management to passive firms such as Vanguard. The sales pitch was simple and resonated with many investors: Why pay someone to replicate an index when you can buy a strategy that does so for a much lower cost? The truth is, investing comes down to more than just cost. Investing properly over lengthy time frames takes effort, skill, knowledge, and discipline—which is why there are costs for professional management. The costs should coincide with the value investors receive—just like buying cars. No one expects an economy car to come with all of the bells and whistles of a luxury car. You pay more to drive a luxury car, and, for many buyers, the enhanced handling, comfort, power, and safety features are worth the extra cost. It follows, then, that active investment management that offers value beyond a basic index fund will cost more. Using active management can involve setting personal financial benchmarks and expectations for investors and tracking progress based on those individual parameters—which can be helpful for investors who aren’t comfortable with the level of risk associated with certain index funds. Actively managed strategies can be designed to aim for lower drawdowns and volatility, employ multiple layers of diversification and risk management, or seek enhanced returns. Regardless of what the goal of the active management approach is, it should provide value to the total portfolio. When advisors develop financial plans with clients, they typically share their approach. For successful advisors, this approach is usually holistic in nature and “leaves no stone unturned.” Advisors analyze elements such as the impact of life insurance, annuities, trusts, and charitable giving while considering factors like time to retirement, life expectancy, and legacy goals to form a complete picture of a client’s financial world. After examining these components, advisors will recommend an optimal asset allocation for a client to progress toward their financial and life goals. It makes sense that a holistic approach to financial planning should be accompanied by a similarly holistic approach to investment management. Active management was never intended to replace traditional buy-and-hold investing. It’s meant to be a dynamic piece of the total portfolio and should be analyzed for consideration like any other financial product. The financial media has too often generalized this conversation as “active versus passive,” implying one is better than the other. Instead, it should be about how the two investing methods complement each other. Adding active management is intended to improve the overall client experience by enhancing returns and reducing volatility over the long term—pushing out an efficient frontier of possibilities. The following graphs highlight some of the differences between active/passive combinations of strategies and purely passive approaches. Passive assets are represented by ETFs tracking the S&P 500, a bond index, and gold, going back to 2005. Several active strategies were included in the analysis, including a momentum and mean-reverting strategy with different trading intervals. No rebalancing is assumed in this analysis. The first thing everyone learns when diversifying assets is to buy things that are different, like stocks and bonds. When stocks go up, bonds go down, and vice versa. Over time, this smoothing effect produces better returns for less risk. Adding active strategies to a passive portfolio has the same effect as adding bonds to a portfolio of all stocks. The efficient frontier moves out and performance possibilities improve. Achieving this shift up and out of the efficient frontier involves three main considerations: time, trading style, and diversification of manager style. Time consideration involves making sure all of the active strategies in a portfolio do not have the same trading frequency and that the active strategies trade on different interval lengths. An example might be having a strategy with a potential to trade daily or monthly and combining it with one that might have a handful of trades in a given year. Sometimes technology stocks are in vogue, and sometimes it’s hot to own consumer discretionary stocks, but it’s better to always own a little of both to avoid trying to chase what “the market” is doing at a single point in time. Sometimes it pays to trade every day or every few days, while sometimes it pays to hold on and ride the trend in the market. Riding the trend makes style diversification important as well. Style refers to the trading style of a strategy. Most active strategies fall into two categories: momentum and mean reverting. Momentum strategic management refers to strategies that identify trends in the market and invest accordingly. They typically miss the tops and bottoms by buying and selling based on underlying shifts in the market. Mean-reverting strategies take the opposite approach by attempting to identify market extremes and looking for a move back toward equilibrium. The two styles are the opposites of each other but offer complementary attributes. When “the trend is your friend,” all momentum strategies will tend to outperform mean-reverting strategies, which have more of a tendency to get “chopped up” trying to pick tops and bottoms along the way. Finally, diversify by management style. Diversifying management style is just as important as diversifying time and trading style. Every portfolio manager or strategist has certain biases toward the market and the methodologies used to create active, rules-based strategies. Some are more risk averse than others, writing rules to see trade signals strongly confirmed, while some may see the start of a setup and move quickly in, hoping to grab any initial market move. Regardless, manager biases are likely to find their way into every quantitative trading strategy. Find a third-party investment firm that offers a variety of management styles, either through the use of subadvisors or by having a large universe of active strategies that have many fundamentally different management styles. Improving efficient portfolios is possible with time, style, and manager diversification, but what happens when the market is directionless and difficult to trade, like it was in 2015? In 2015, the S&P 500 lost value in terms of absolute price but made money due to dividends, while gold declined nearly 10%. The following illustration highlights what happens when you properly incorporate several active strategies into a traditional passive portfolio built of stocks, bonds, and gold. In 2015, one of the active strategies included in this analysis, a momentum strategy, declined more than 20%. A mean-reverting active strategy included in the analysis increased over 20%. 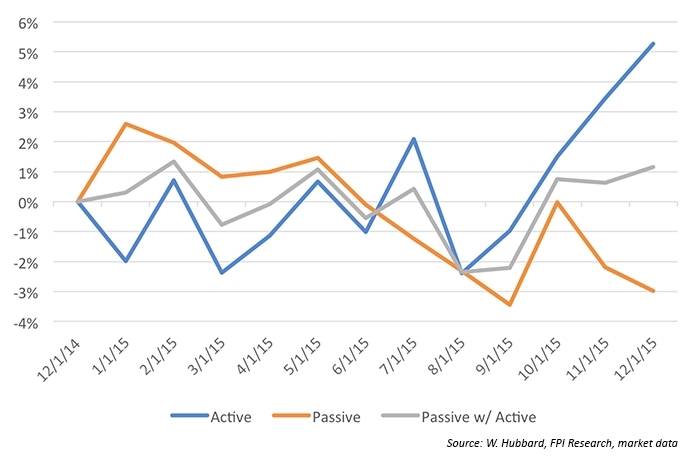 Other active strategies’ returns fell between the two extremes. A purely passive strategy declined approximately 3%. Despite having a significant portion of the overall combination portfolio decline more than 20%, the net result was a positive year thanks to a set of active strategies diversified based on time, trading style, and manager style. While this example is simplistic, it illustrates the point. In other years, the performance of various types of active strategies might vary tremendously from 2015, but having a portfolio of highly diversified and differentiated strategies can mitigate risk and enhance performance versus a purely passive approach. When meeting with third-party investment managers, ask open-ended questions around the methodology behind active strategies, the time frames the strategies will trade, and how strategies differ in management style and rules orientation. These types of questions will result in increased confidence in selecting a holistic portfolio of active—and passive—strategies that are well-diversified on many levels. William Hubbard is a quantitative money-management analyst. He has spent his career focusing on how active management can generate results regardless of market direction. He earned his bachelor’s degree in electrical engineering, with a minor in economics, from Oakland University and is currently a candidate in the Chartered Financial Analyst program.